You’re shedding me! | Will My Dog Hate Me? Sorry, but it’s true. There’s nothing you can do to keep your dog from shedding. Nor should you want to. Shedding is a natural, ongoing process for dogs, just as it is for humans. As anyone who’s ever worn a black sweater or jacket can attest, regular brushing and combing won’t prevent some divestment of hair. But some dogs, like some people (say, males of a certain age), shed more than others. The double-coated breeds are the worst offenders; many send forth so much hair that they practically create an alternative dog, giving rise to the expression “blowing coat” (which has always sounded vaguely druggie to me). Which brings to mind — I’m not even going to try to explain the chain of associations — the fact that some people spin dog hair and weave or knit it into clothing. I find this intensely creepy –- not the least because, should I be complimented on them, I wouldn’t want to admit that I was wearing a scarf or sweater made from Frankie. The only consolation about the mass exodus of hair is that it’s seasonal, and therefore predictable. Increases in daylight and warmth in spring signal certain canine brains to release hormones that spur the dogs’ undercoat to grow and push off their topcoats. A similar though somewhat less dramatic version of this process occurs in fall, when the pups know they need to grow a new winter coat (unlike kids who always require back-to-school wear, at least dogs do it themselves and never demand designer labels). A few things can interfere with regular shedding. Seasonal confusion: If you keep a dog who’s genetically programmed to shed seasonally indoors most of the time, he may not register natural changes in temperature and light and therefore shed year round. Copiously. Which proves it’s a bad idea to mess with Mother Nature. Bad shampooing practices: Using human shampoo can dry your dog’s skin, as can shampooing too often. Even dog shampoos with perfumes that are not from natural sources may result in hypersensitivity –- all additional causes of shedding. Overstimulation: Excitement and stress can trigger hair-loss hormones, too. If you can’t get your dog to meditate, consider Doga. Health problems: In rare cases, excessive shedding may be a symptom of a health problem, from a food allergy to a thyroid imbalance. If your dog isn’t the shedding sort or if the off-season hair loss seems excessive, check with your vet. Still, if shedding can’t be prevented through grooming, it can be managed by it; see my recent do-it-yourself grooming post. It’s far better to have hairs concentrated on a brush or on a newspaper than randomly faux-carpeting your floor or creating furry throws for your couch. You can entrap large swathes of your dog’s coat with a rake or de-shedding tool*, even –- or especially – during her molting season. There’s always the vacuuming fallback. But that’s for another post. *Exciting news: The response in the comments section of the aforementioned grooming post was so enthusiastic about the FURminator, one of the included products, that the company noticed and offered to send me one for review. I can’t use a FURminator on Frankie, who would be completely denuded, but I plan to give one away in a contest. 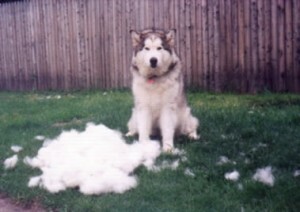 We have a picture of Buster, our GSD (and also an incredibly sheddable breed), with a similar mound of hair. And Ty, our Shar-Pei, has an fine undercoat that seems to wind up EVERYWHERE. 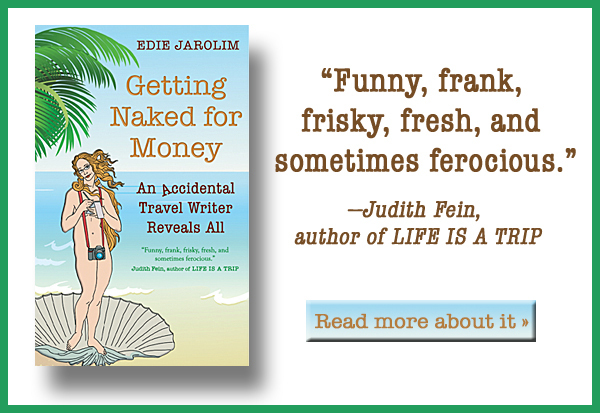 It used to really bother me – I was raised a neat freak. Now it’s just hair. We brush … we vacuum … we repeat. The dogs are worth it. Just saw a YouTube video/song – There’s Dog Hair In Everything I Do. Seems appropriate. Feel free to send the picture of Buster and his hair mound. I’d love to post it (maybe I’ll do a hair mound series…). I never was a neat freak but am nevertheless pleased that Frankie is a non-shedder. I’m allergic to vacuuming. I read your article, said hmm good time to take Jake out and brush him. Took Annie too, but figured she would run and hide from the devil comb. I use a Furbuster (a FURminator imposter) that takes out Jakes undercoat. Annie, with a calm steady approach, allowed her back to be combed. Jake had several large tufts of hair floating around the yard. This year I plan on staying a step ahead of Jakes shedding schedule. Glad this post inspired you to get started early… but of course we never know when spring is going to arrive in Arizona! But with all the hairy dogs I’ve had (Lhasa, Afghan, Eng Springer Spaniel, Shih Tzu) your picture of the Malamute is the scariest I’ve seen…was that the work of a Furminator?? Oh, my, that sounds like a lot of hair you’ve dealt with, Mary! I’m not sure about how that hair was removed; the site just mentioned a de-shedding tool rather than a specific type. Even when I get dressed up, my clothes have pet hair on them. I wear it as a badge of honor. Sweety, my smooth coat Border Collie has shed like the dickens since day 1. She’s white, so it’s visible everywhere. My Dalmatian was a seasonal shedder, who also shed more when his health was off. I’m lucky with Zeus (my APBT) is short haired doesn’t shed. Not sure if it was here or on another blog, but we sell the Furminator at the store where I work, it seems to be very popular here. Yes, you mentioned the FURminator — and a police officer who ultimately wore one out — on this blog. I’m going to have a contest to win a new deluxe FURminator model. Stay tuned! seems like a natural – pix of pets with their piles of furminated fur – wonder if the company would get excited about seeing those – Teddy Bear will fill three bags full this spring no doubt.